All things being equal, no one wants to worship the living God in an ugly building. If the stars proclaim his handiwork, so should church architecture. But how does an ugly building become a beautiful one? One answer is to pay the right people, or at a minimum, ask the right people to volunteer. Let’s go deeper, though. Who are the “right people”? And how did these people become good at what they do? When Christians teach about spiritual gifts, the conversation often focuses on gifts such as teaching and preaching, or administration and acts of service. If not these, the focus is probably on speaking in tongues and healing. This post, however, isn’t a post about those gifts. It’s a post about the often overlooked spiritual gift of craftsmanship and artistic design. In the book of Exodus, two men (and one man in particular), were explicitly said to be given this spiritual gift (Exodus 31:1–11). God’s people had lots to build. There was the tent of meeting, the ark of the testimony, the mercy seat that is on it, all the furnishings of the tent, the table and its utensils, the lampstand with all its utensils, the altar of incense . . . and the list keeps going and going (vv. 7ff). Remember, you can’t buy this stuff at Ikea or even Restoration Hardware. It had to be made. And when it was made, it was to be done with care; each aspect of the design was to reflect the creative beauty of God himself. So what did God do? He filled individuals “with the Spirit of God, with ability and intelligence, with knowledge and all craftsmanship, to devise artistic designs, to work in gold, silver, and bronze, in cutting stones for setting, and in carving wood, to work in every craft” (vv. 3–5). In short, God gave people the gift of craftsmanship and artistic design. This is a gift I’m so thankful God has given to people in our church. Currently, we are planning for a building move which will involve, among other things, a 5-month renovation project. 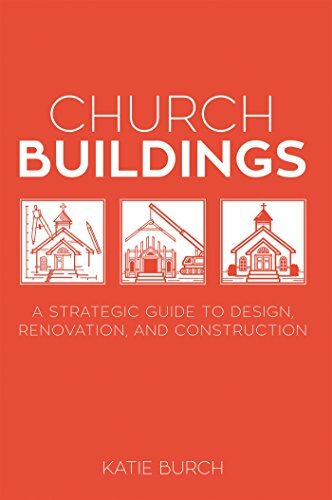 In preparation for the move, a book that I found helpful was Church Buildings: A Strategic Guide to Design, Renovation, and Construction by Katie Burch, a Christian architect who specializes in church building projects. If your church is going through a building project, I highly recommend that your leaders read it. Also, to prepare for the renovation I assembled various subcommittees, including an “Aesthetic and Design Committee.” Any guess who is on the team? Individuals who have the spiritual gift of design. In fact, this morning we met to go over the architectural drawings, as well as make the final carpet and color selections for the whole church. Exciting stuff. In the rest of this post, I thought I’d pass along some of the guiding principles I put together for our design team. These might be boring to many of you. But maybe, just maybe, they will spark a passion to make your local church more beautiful, whether through a large-scale renovation project or simply as you give a long overdue facelift to the décor in your church nursery. Please make sure you modify the principles to fit your context. Make selections based on the interest of the whole church, not just a few individuals. Here’s a caveat though. Don’t feel like you must consult lots of people to get their opinion. Don’t do that. You’re on the aesthetic and design team because we want you to pick the things you like (because we like what you like!). Our church leadership is asking you to think about others as you choose design features, which is different (and wiser) than asking everyone to give their opinion. There should be continuity throughout the building. Each of the children’s rooms can be distinct from each other (even distinct from the rest of the building), but each children’s classroom should feel like it belongs in the whole building. This is the opposite of hodge-podge. To use another example, we want our church to be decorated like a university that has continuity across its campus, and not like a shopping mall where each store has its own design. Go for a “feel” that is both transcendent and relevant. I say this because that’s what I think the Bible is. The Bible has deep roots (“In the beginning, God . . .”), but it also speaks to our everyday lives. The Bible is then, and it’s now. Each week when we preach, we try to show how the Bible is both then and now, both transcendent and relevant. Let’s try to bring it out in our aesthetics too by tastefully blending classic and contemporary design. When it comes to the decision of what to keep and what to toss, let’s lean toward the principle, “Out with the old; in with the new.” This is not a rule so much as it is a guideline. Sometimes, in my opinion, in the name of frugality (perhaps an idolatry of frugality), churches unduly sacrifice beauty by reusing things that are, well, used up. There’s a question that has been important throughout the history of our denomination (The Evangelical Free Church). The question asks, “Where stands it written?” The idea is that everything Christians do should be governed by the word of God. Therefore, we would love to see our church decorated with Scripture and thoughtful quotes about Scripture from Christians who have come before us. Don’t get stressed about this. It should be fun!